Around the Knee, the main Muscle Groups are the Quadriceps Muscle (Four Muscles at the front of the thigh) and the Hamstring Muscles at the back of the thigh. Some Calf Muscles originate just above the Knee and help with Knee bending as well. Quadriceps is a group of Four Muscles (Vastus Medialis, Vastus Intermedius, Vastus Lateralis & Rectus Femoris) forming a single tendon to get attached to the upper pole of Patella. When they contract the Knee is straightened or extended by pulling on the Kneecap. 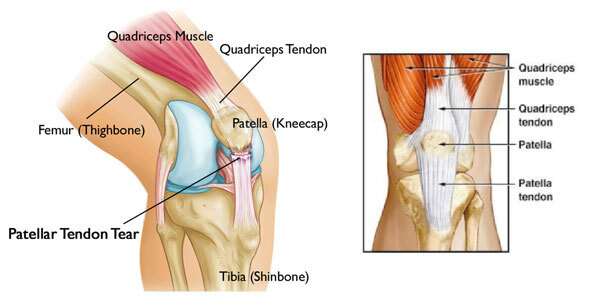 Quadriceps is the most important Muscle targeted by Physiotherapy to restore optimum Knee Function. It is an extension of the Quadriceps arising from the lower pole of the Patella which gets attached to the front of the Tibia (Tibial Tuberosity). Three large Muscles (Semitendinosus, Semimembranosus, and Biceps Femoris) in the Posterior aspect of the thigh are commonly called the Hamstring Muscles. The Hamstrings have a common proximal attachment to the Ischial Tuberosity deep to the Gluteus Maximus, but one of them, the Biceps Femoris, has an additional attachment to the body of the Femur. They also have a common nerve supply from the Sciatic Nerve. 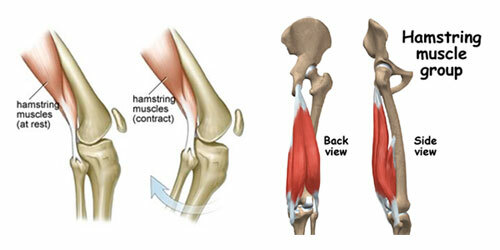 The Hamstring Muscles span the Hip and Knee Joints; hence, they are Extensors of the thigh and Flexors of the leg. Both actions cannot be performed fully at the same time. The Gastrocnemius is the most prominent Muscle of the Lower Leg & is responsible for the curvy shape of the calf. The Gastronemius Muscle has two heads originating from the Femoral Condyles and joining the Soleus Muscle to form the Achilles Tendon which inserts in to the Calcaneum (Heel Bone). The Gastronemius passes over two joints, the Knee and the Ankle. It coordinates with other muscles to move each of these joints. The Gastrocnemius along with the Hamstrings Flexes (bend) the Knee in activities such as running or going up stairs. Along with the Soleus Muscle, the Gastrocnemius Plantar Flexes (straightens) the ankle in movements such as pointing the toes or rising onto "tip toe". By forcing the ankle into Plantar Flexion, high heel shoes contract the Gastrocnemius to make it more pronounced. Quadriceps Tendon over the distal end of the Femur. Prepatellar Bursa between the Patella and the skin, results in "Housemaid's Knee" when inflamed. It allows movement of the skin over the underlying Patella. Deep Infrapatellar Bursa between the upper part of the Tibia and the Patellar Ligament. It allows for movement of the Patellar Ligament over the Tibia. Subcutaneous [or superficial] Infrapatellar Bursa between the Patellar Ligament and Skin. Pretibial Bursa between the Tibial Tuberosity and the skin. It allows for movement of the skin over the Tibial Tuberosity. Lateral Gastrocnemius [Subtendinous] Bursa between the Lateral head of the Gastrocnemius and the Joint Capsule. Fibular Bursa between the Lateral (Fibular) Collateral Ligament and the Tendon of the Biceps Femoris. Fibulopopliteal Bursa between the Fibular Collateral Ligament and the Tendon of the popliteus. Subpopliteal Recess (or Bursa) between the Tendon of the Popliteus and the Lateral Condyle of the Femur. Medial Gastrocnemius [Subtendinous] Bursa between the Medial head of the Gastrocnemius and the Joint Capsule. Anserine Bursa between the Medial (Tibial) Collateral Ligament and the Tendons of the Sartorius, Gracilis, and Semitendinosus (i.e. the Pes anserinus). Bursa Semimembranosa between the Medial Collateral Ligament and the Tendon of the Semimembranosus. There is one between the Tendon of the Semimembranosus & the head of the Tibia & occasionally there is a Bursa between the Tendons of the Semimembranosus & Semitendinosus.